While getting your hardwood floor installed, you have to keep in mind that you are investing in wood flooring that you may be walking on for decades to come. With that in mind, you want to make sure it’s done right. 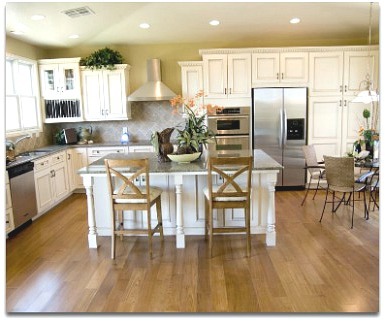 So to get quality hardwood floor that stands the test of time calls us at Sandy Springs Hardwood Flooring! Our wood flooring specialists are top notch professional hardwood flooring installers in Sandy Springs that will provide you with the greatest in customer service. ​The choice of installing a hardwood floor can be a fantastic one over other options such as carpet and tile. The choice doesn’t stop there though there are a variety of options to choose from when it comes to what kind of hardwood flooring you want to be installed in your home. With the new age of wood flooring there are also several different types of installation such as “engineered,” “pre-finished,” and “laminate” flooring. 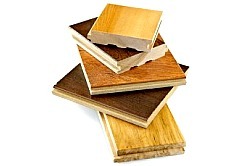 Sandy Springs Hardwood Flooring can explain all of these options to you. We can even show you different samples of hardwood flooring if you get in contact with us today to schedule someone over to visit your home in Sandy Springs, Georgia. Our hardwood flooring company can give you an estimate that beats our competitor flooring companies, and help you pick the right wood floors for your home. An estimate done by our hardwood flooring specialists from Sandy Springs Hardwood Flooring consists on quite a few different dependencies and options. For example, the kind of wood you want to use on your wood flooring. Oak is some of the most popular in hardwood flooring, but there are very many other options that consist of a variety of different trees available. The cost and immediate availability are different for each one which our hardwood flooring specialist will show you. The kind of subfloor our hardwood flooring company will be attaching your new hardwood flooring too is also a big factor in both options, labor, and ultimate end total on your estimate. Our specialists at Sandy Springs Hardwood Flooring knows exactly how to handle your installation regardless if it is on a cement slab, particle board, oriented strand board, plywood, existing wood floor, or any other. The installation time of your new hardwood flooring dependent on how much floor space, and how many rooms you want to be done can take within one to two weeks to accomplish. In that time, our hardwood flooring company will keep you apprised entirely every step of the way including any set-backs that are very unlikely to occur, and any questions you may have along the way. Once we get started on the installation of your brand, new hardwood flooring our hardwood flooring company promises that we will stand by our estimate. 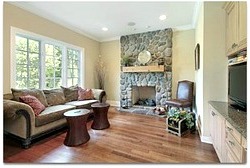 ​ We will get your new hardwood floor done for you promptly so that you and your family can get back to your daily lives. ​After many years of owning a hardwood floor in your home, you may need to inspect it. If you begin to see your finish disappearing, fairly deep scratches, and other damage to your hardwood floor, then it may mean you need a refinishing. Refinishing hardwood floors is something you want to leave to the professionals. It’s true that you could rent the proper equipment to work on the wood flooring yourself. However, there are many mistakes that you could make in the process, potentially causing damage, that could be avoided by hiring a hardwood floor specialist. Taking on the job of refinishing hardwood floors takes a lot of time in some cases it can take days before a professional is done with it. You may believe that doing it yourself will save you a lot of money on the cost to refinish hardwood floors. In just the extra time alone you will spend refinishing the hardwood floor yourself instead of watching a professional from a hardwood flooring company you will probably have lost money in your own personal time instead. If you think about all of the things you could be doing while someone else is refinishing your hardwood floor, the savings in time alone in many cases will stack up pretty quickly. Sanding equipment is not something you should take lightly, and assume it is as easy to operate as our solid wood flooring specialists make it appear. If operated incorrectly, you can leave your hardwood floor very uneven, and as a result, end up paying a hardwood flooring company more than you originally intended to fix it. It takes multiple different sanding disks, or sanding paper to get it done, and our specialists know exactly which ones to use, and when. Not to forget that the mess you leave from your hardwood flooring could have your family coughing for weeks as you try to get all of that fine sawdust vacuumed out of your home. Sandy Springs Hardwood Flooring brings in our sanding equipment made for the job and know better than anyone in Sandy Springs, Georgia on how to use it. Depending on how many rooms you have with hardwood flooring the process can take a few days, and leave your wood floors with a finish ready for daily hardships for years to come. The first round of sanding is done with a rough sanding pad to remove the previous finish and any filler that may be present on the floor. After the filler is re-applied, we proceed to go through multiple runs on your hardwood flooring with different grades of sand paper to ensure we don’t leave any sanding marks. Screening is then done to your wood flooring for that final smoothing before we begin the clean-up. We clean off anything left from the sanding process and ensure that not a spec of sawdust is left on your hardwood floor before we begin coating. 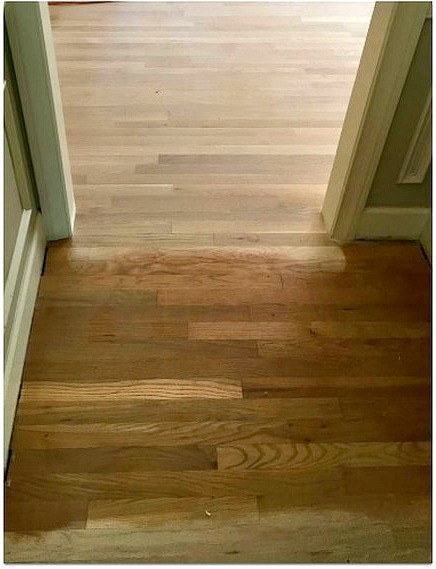 Finally, we begin coating your beautiful fresh hardwood floor until completion to give it a brand new look that will leave you glad that you hired us at Sandy Springs Hardwood Flooring. ​ Have you gotten tired of the look that your old floor? The answer isn’t always to tear up your old wood flooring, and get started on a new hardwood flooring installation when there is a much cheaper solution available. You can simply change the tone, and color of your lovely wood flooring by having a specialist from our hardwood flooring company come over to have it stained. 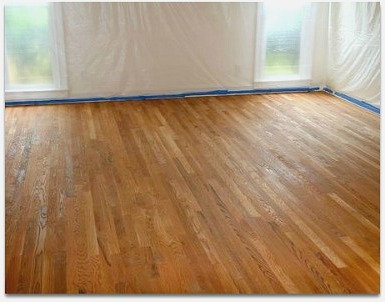 To have the old stain removed, and have the new stain applied requires the sanding of your wood flooring. We here at Sandy Springs Hardwood Flooring make this a very easy, and affordable process for you, so it doesn’t seem like too much of a hassle to get a new look from your hardwood floor. Our specialist will be happy to come over after you call, and schedule with us to get an estimate done. It doesn’t matter the reason for the change if you are trying to get a new color for your home from the stain on your hardwood floor. Perhaps you are trying to get all of your hardwood floorings in your home to match regardless of their age. 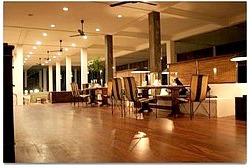 We are the right hardwood flooring company for the job.